Happy May! Earlier this month EPT and the GVP received acclaim in Time magazine’s ‘The World is not Ready for the next Pandemic.’ Scroll on for access to that story, exciting updates from West Africa, the latest Emerging Pandemic Threats update, and a recent case study publication. At the very end you’ll find the latest from the UNFCCC (UN Framework Convention for Climate Change), a synthesis paper that brings climate change to the One Health conversation. May 15- Launch: Global Health and the Future Role of the United States, D.C.
June 6-7- Workshop: Building a National Capability to Monitor & Assess Medical Countermeasure Use in Response to Public Health Emergencies, D.C.
Late last week, TIME magazine launched a story featuring our Predict project. The authors dive deep into the current state of viral affairs, and make a case for why we need to continue efforts to get ahead of epidemics. Read the full story here. 481 poultry outbreaks, 191 wild bird outbreaks, 1 camel outbreak, and 79 human infections with 10 pathogens (various avian and swine influenza viruses, MERS-CoV, monkeypox) were reported by 24 countries between April 11 and May 7, 2017. These outbreaks/infections occurred between November 2016 and May 2017. After several months of very high activity, H5N8 HPAI outbreaks in birds and H7N9 AI human infections ​continue to decline. This is typical of avian influenza viruses which are at their most active between about November and March. Because of an absence of large hospital clusters, the total number of MERS-CoV cases between January and ​April 2017 is lower than for the comparable time period in all years since 2013. A total of 375 human infections (0.3% average case fatality rate) have been reported by 3 countries between 2009 and 2017. A total of 999 bird outbreaks (more than 71.6 million birds affected) have been reported by 4 countries between 2012 and 2017; no human infections reported to date. H5N6/Asia HPAI – 367 poultry outbreaks and 169 wild bird outbreaks (China, Japan, South Korea, Vietnam). 415 of these outbreaks took place in November and December 2016, but were only recently reported. A total of 677 bird outbreaks (more than 28.9 million birds affected) and 17 human infections (35% average case fatality rate) have been reported by 6 countries between 2014 and 2017. A total of 2,798 bird outbreaks (more than 19.8 million birds affected) have been reported by 46 countries between 2013 and 2017; no human infections reported to date. A total of 144 bird outbreaks (more than 23.3 million birds affected) have been reported by 1 country between 2012 and 2017. 5 human infections (0% average case fatality rate) have been reported by 3 countries between 2004 and 2012. A total of 37 human infections (3% average case fatality rate) have been reported by 3 countries between 1999 and 2017. A total of 2 monkey outbreaks and 770 human infections (3% average case fatality rate) have been reported by 12 countries between 1970 and 2017. The Government of Guinea (Ministries of Health, Livestock, Agriculture, Environment, and Security) with UN and USG partners successfully completed the WHO Joint External Evaluation (JEE) on April 30th, 2017. Government of Guinea experts across technical areas including surveillance, laboratory, workforce, immunization, emergency response, etc. participated in the JEE with 12 external evaluators from WHO, CDC, USDA and France. The rigorous process highlighted progress since GHSA launched in early 2016, including improved ability to prevent healthcare acquired infections (HCAI), increased biosafety & biosecurity trainings; expanded immunization coverage and capacity; and strengthened surveillance and laboratory capacity. The animal health sector remains weak, but the ongoing USAID GH SA activities continue to identify gaps and help to address these deficiencies. FAO provided support to the Minister of Livestock for a site visit to the Central Veterinary Laboratory with the JEE assessors. 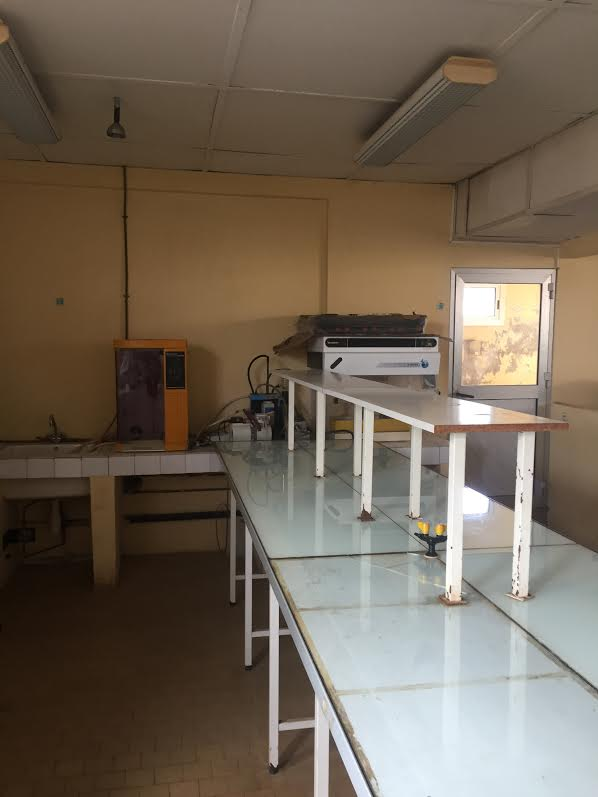 USAID, through FAO, is providing support for renovations and technical support to the Central Veterinary Laboratory. While the laboratory staff are knowledgeable, the facility needs support to function; and more assistance is needed to increase surveillance for animal health and outbreaks to provide samples to the laboratory. A few initial take- aways from the JEE- there was excellent multi-sectoral participation, the process continues to broaden the conversations beyond Ebola response efforts to examine capacity in other priority areas and make recommendations for improvement, and the creation of the National Agency for Health Security (ANSS) in Guinea plays a critical role in the sustainability of the increased national epidemic preparedness and response capacity. 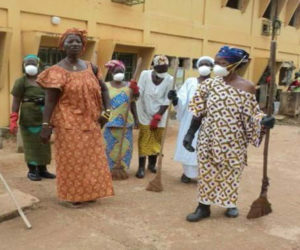 It is apparent that the Ebola funding and recovery efforts have already improved capacities in the ability to prevent, detect and respond, but there is much work left to be done in order to achieve GHSA and JEE targets. The Minister of Health, Dr. Abdourahmane Diallo, and the DCM of the US Embassy, Hughes Ogier, participated in the closing session. Minister Diallo discussed the importance continuing collaboration to address gaps and continues to increase capacity across JEE technical areas. For more information visit the following page. 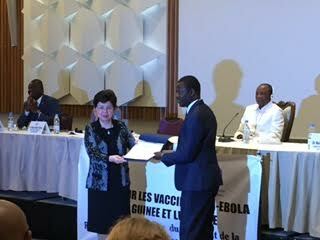 In response to the 2014 Ebola outbreak in West Africa, global health leaders called for the rapid development and deployment of a licensed Ebola vaccine as part of an integrated outbreak control and prevention strategy; and Gavi created a plan to respond to the Ebola crisis to help ensure access to a vaccine when it becomes available. Beyond the vaccine discussions, Dr. Tolbert Nyenswah, the Director General of the National Public Health Institute of Liberia (NPHIL), discussed the importance of Global Health Security to expand the capacity built for the Ebola outbreak for other diseases; as evidence by their rapid response to a mysterious illness. Sierra Leone’s Health Minister, Dr. Abu Bakar Fotanah, discussed the need for One Health efforts to prevent another outbreak. Overall the workshop served as an excellent forum to celebrate the achievements made together during the Ebola outbreak and while applied lessons learned and discussing areas for improvement. Climate change presents a risk to health in a variety of ways. The health risks resulting from climate change impacts in countries are changing and the interlinkages between health, climate change and other drivers of global environmental changes are complex and need to be better understood. A large number of activities ranging from policies that are planned and implemented by governments, to various actions undertaken by intergovernmental organizations, non-governmental organizations and communities are already under way in order to address climate change impacts on health. However, a number of challenges, particularly with regard to awareness and education, as well as planning, capacity and financial mechanisms continue to limit action on the ground. In order to better protect human health from the impacts of climate change, numerous collaborative actions need to be implemented. Read the full paper here.